Erdoğan was a semi-professional footballer playing for Kasımpaşa between 1969 and 1982 before being elected as the Mayor of Istanbul in 1994. 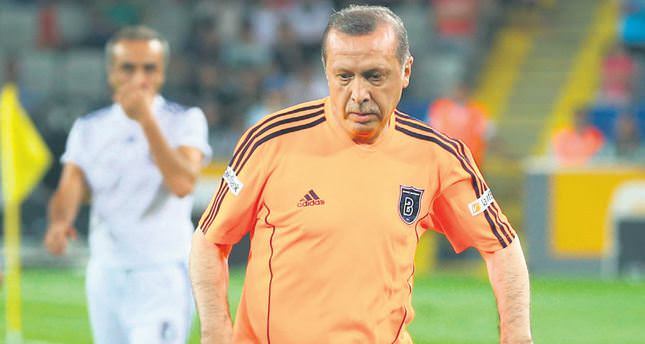 'Football diplomacy' was obliterated by Turkey's Prime Minister Recep Tayyip Erdogan. In March 2003, Recep Tayyip Erdogan became the Prime Minister of Turkey, replacing Abdullah Gul; the latter took the post of the Foreign Minister. Meanwhile, Ahmet Davutoglu was invited to become the Prime Minister’s chief foreign policy adviser. This triumvirate would shape Turkish foreign policy for the next decade. The “Armenian opening” was one of the most challenging tasks for these foreign policy makers of Ankara. Erdogan, a graduate of the religious Imam Hatip School and a former semi—professional football player, was the trio’s most powerful figure, yet he had a relatively passive role in shaping Turkish foreign policy. This is best explained by his narrow worldview. His chief adviser, Ibrahim Kalin, would later describe Erdogan as a politician rather than a diplomat, and one with a poor understanding of international relations. In Kalin’s words, Erdogan “passionately believes in such values as justice” and equates such values with Islam. In hosting Sudan’s President, Omar al Bashir, in 2008, Erdogan brushed off the International Criminal Court indictment against al Bashir for genocide, claiming Muslims cannot commit genocide. Indeed, when it comes to mending fences, Erdogan is not the best candidate for the job. His tirades and hate speeches have even led to a breakdown in Turkey’s relations with Israel, Egypt, and Syria. Already serving as President in 2008, Gul accepted the invitation from his Armenian counterpart Serzh Sargsyan to visit Yerevan. This was the start of what has become known among foreign policy circles as “football diplomacy.” As Gul had been the driving force behind the Armenian opening in Turkey, his Foreign Minister, Ali Babacan, was an excellent candidate for the routine work. An economist educated in the US, Babacan is a pragmatist, and according to a senior Armenian diplomat, “open to new ideas.” This Gul—Babacan duo appeared to be the key to moving forward the process of normalization. As these pragmatists pushed the process forward, Turkey’s ideologues did not hesitate to jump in and wreak havoc. And they did it quickly. In May 2009, Babacan was replaced by Ahmet Davutoglu. A historian who refrained from studying in the West and preferred the Islamic world, Davutoglu had extensively written on the problems of Turkey and the Islamic world. Those familiar with his works viewed him as a man who deeply believes in civilizational differences and sees the world through a religious prism. Upon taking the office of Foreign Minister, Davutoglu, according to senior US diplomat David Phillips, rushed to scratch the Protocols between Armenia and Turkey. The man who had noted in his book Strategic Depth that the loss of Nagorno-Karabakh was Turkey’s greatest territorial loss since the Cold War intended to push Armenia to make unilateral concessions. A few days later after Davutoglu’s appointment, Erdogan went to Baku to allay Azerbaijani fears about normalizing Turkish-Armenian relations. What happened next was unimaginable for Gul and for Davutoglu. Ignoring the briefings by the Foreign Ministry, Erdogan declared that borders with Armenia will not open until Armenian troops withdraw from all “occupied territories of Azerbaijan.” In a moment of irony, the “football diplomacy” was obliterated by none other than a former footballer because of his aversion to diplomacy. In 2010, Armenian President Serzh Sargsyan had to suspend the ratification of the Protocols due to this Turkish policy of linkage. Sargsyan expressed gratitude to President Gul “for political correctness displayed throughout the period and the positive relationship” that had developed between them. As Gul left the office in 2014, Armenia lost the last pragmatist in Turkey’s political elite, while Babacan, in the position of deputy Prime Minister, continues to struggle with Erdogan’s disastrous economic policies. Davutoglu, the former academic, is now Turkey’s Prime Minister and has been gradually developing polarizing vocabulary for domestic politics. Erdogan, for his part, has set his sights on turning Turkey into a presidential republic so as to remain at the helm of Turkish politics. Whenever someone speaks of the “Armenian opening,” it is to blame Gul for “giving Armenia an upper hand in relations with Turkey.” Within this context, the new Foreign Minister, Mevlut Cavusoglu, is left with no other option but to fault Armenia for stalling the normalization process, and to lay the blame for Turkey’s tarnished image abroad with the Armenian Diaspora.